This classification covers establishments primarily engaged in performing metal mining services for others on a contract or fee basis, such as the removal of overburden, strip mining for metallic ores, prospect and test drilling, and mine exploration and development. Establishments that have complete responsibility for operating mines for others on a contract or fee basis are classified according to the product mined rather than as metal mining services. Establishments primarily performing hauling services are classified under transportation. While most large national and international mining companies retain private divisions specially outfitted for mining services, even the largest companies continue to contract specialty mining services companies for jobs requiring particular expertise, extra speed, or outside consultation. The total number of U.S. mining companies totaled 125 in 2002, compared to 179 in 1997. At the turn of the twenty-first century, two of the leading U.S. companies for metal mining services were Battle Mountain Gold Co., of Houston, Texas, and Newmont Mining Corp. of Denver, Colorado. With sales of nearly $230 million, Battle Mountain operated as a public, stand-alone company specializing in gold mine exploration and mining of gold and silver and metal mining service. The company produced more than 890,000 ounces of gold per year. Sales at Newmont Mining Corporation hovered near $1.4 billion, and Newmont's subsidiary, Newmont Gold, was the largest U.S. gold producer. In 2001, Newmont acquired Battle Mountain for $794.2 million in stock. The deal increased Newmont's gold reserves by 17 percent. The metal mining services industry offers a wide range of services. Geographically speaking, the state of Nevada has the most companies engaged in mining services. Most of these companies are small operations engaged in the physical tasks involved in mining, as well as in planning, development, and exploration. Some companies specialize in preparing mine shafts and tunnels, while others offered test boring services. In this age of outsourcing, the metal mining services industry should be growing, but the decline in overall mining is limiting its growth. The overriding trend in modern metal mining has been toward the development of improved equipment to ensure better working conditions, the potential exploitation of lower-grade ores, and the design and construction of bigger and deeper mines. Where companies involved in metal mining services did not themselves develop new technologies toward such ends, they made use of a plethora of advances made by other mining companies and associations. Surface mining in 2001 accounted for 97 percent of all crude industrial ore mined, which totaled 3.3 billion tons, in the United States. Metal consumption declined by 12 percent in 2001 and by another 10 percent in 2002. As a result, production also waned, falling by 21 percent between 1997 and 2002. 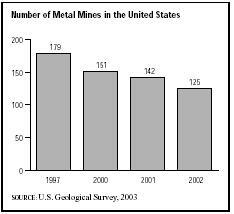 The number of U.S. metal mines in operation over this time period decreased from 179 to 125, and the number of metal mining employees dropped from 42,202 to 27,230. MINExpo International, an annual event held in Las Vegas, is a dynamic forum displaying many of the latest mining technologies, including Integrated Mine Planning System (IMPS), a system for geological interpretation and modeling featuring computer-aided drafting (CAD) technology that allows engineers to manipulate plans, design options, and even insert equipment within specific parameters; hydraulic drills that replace pneumatic models; computer-controlled underground drilling jumbos; computer programs to help evaluate and plan ventilation systems and other mine conditions; a variety of communication systems; and other advances that are intended to benefit the metals mining services and their workers. Occupational opportunities in the mining services industry range from those involved in the physical tasks related to mining to those responsible for the planning and development of mining, testing, and prospecting. In the mining, quarrying, and tunneling domain, the industry employs workers as varied as rock splitters—who separate rough dimensions of rock and ore using jackhammers, wedges, and feathers—and mining machine operators, responsible for the operation of equipment including truck-mounted or portable drills, continuous mining machines, channeling machines, and cutting machines for underground excavation. In the planning and development domain, the metal mining services industry employs a wide variety of mining engineers trained in locating, extracting, and preparing metals for industry use. In addition to designing and supervising most functional aspects of metal mines, such engineers conceived new plans and equipment to improve safety and health conditions, environmental compatibility, and efficiency of mines. While more than half of the jobs held by mining engineers in the late 1990s were in the mining industry, a large percentage transferred each year to other occupations, such as engineering consulting, government agencies, and manufacturing. Nevertheless, increasingly stringent environmental standards, as well as moves to increase production capacity and productivity while reducing operating costs, promised new challenges and some new opportunities for mining engineers in the metal mining services industry throughout the twenty-first century. National Mining Association. Fast Facts About Minerals, 2004. Available from http://www.nma.org/statistics/pub_fast_facts_2.asp . Proctor, Cathy. "Newmont's Golden Deal with Battle Mountain." Denver Business Journal, 16 February 2001. U.S. Geological Survey. Mining and Quarrying Trends: Industry Overview, 2002. Available from http://www.nma.org/statistics/pub_fast_facts_2.asp .